We’re not talking about the French Riviera, but about an LA-close destination for basking in a bikini – the Riviera Palm Springs. Located in the revitalized northern end of this desert town, the Riviera’s recent $70 million updating – which shows and shines. The spacious rooms with plasma televisions and luxurious bathrooms are enlivened by Andy Warhol art and rich linens. Public spaces and dining areas both have a cool retro feel accelerated by pop art and Chihuly influenced enormous chandeliers. In the lobby area, vivid orange walls bisected with white lattice draw the eye; a between-buildings corridor leading pool-side is covered with faux greenery for the feel of a cool arbor. 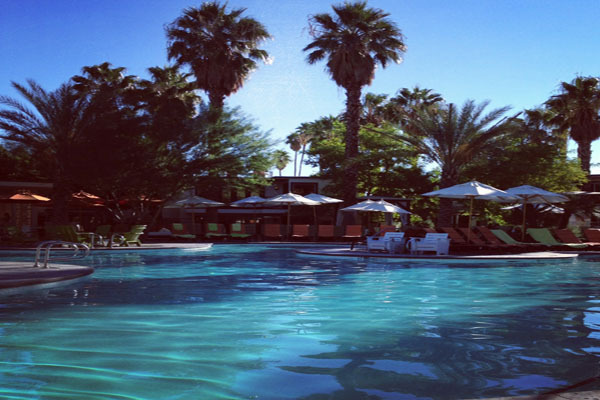 The main attraction with any Palm Springs destination is of course the pool, and the Riviera does not disappoint. Fire pits keep the main pool busy past sundown, and loungers are comfortable and umbrella shaded. The ample, curving, palm-lined pool and hot tub area include sit down dining spot and cocktail service from the Bikini Bar, which also provides pool side offerings. Food and drink service was swift and congenial, and the mixed drinks – many sporting female names and featuring flavored vodkas and fruit – were delicious. Throughout the hotel we were impressed with the staff’s attention to detail – when one afternoon most pool adjoining loungers were full, we were ushered by the staff to an unoccupied lounge bed comfortable enough to induce a sunny nap. Cabanas are also available for rental, and the SpaTerre offers massages, facials, and a state of the art fitness center. A smaller pool and hot tub are at the back of the resort’s twenty-four acre property. Checking out the Circa 59 restaurant for breakfast, our fruit, muffins, scrambled eggs and decadent morning cocktail were quickly prepared and nicely presented in an elegant indoor/outdoor setting with a mix of Rat-Pack era red leather booths and super cool modern lighting and fire pits. 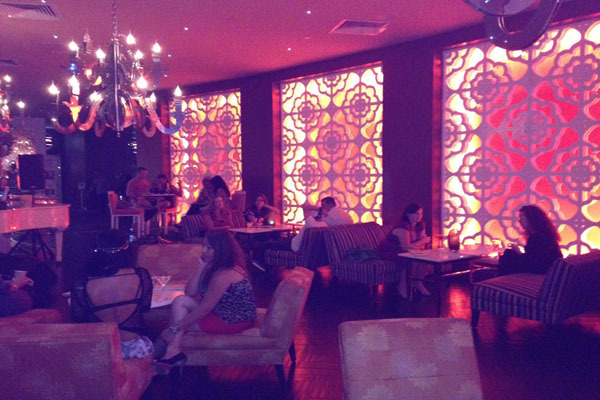 Adjoining the restaurant is the Sidebar lounge, with live acoustic entertainment in the evenings. We spent late night in the sleek Starlite lounge, a weekends-only hot spot with dancing and live music adjoining both the lobby and public space featuring a sparkling pool table, a pearl white baby grand piano, and cozy banquette seating. What did we love best? The pop art on the walls, the friendly and attentive staff, and the feeling of being in a self-contained resort far too relaxing to leave. We did however manage to pry ourselves away long enough to view Seward Johnson’s twenty-six foot tall Marilyn Monroe statue residing until June 2013 at the corner of Tahquitz Canyon and Palm Canyon in the heart of downtown Palm Springs. For more information on the Riviera Palm Springs, please visit www.psriviera.com.